2003, Schortgen Editions, 154 pages, softback. 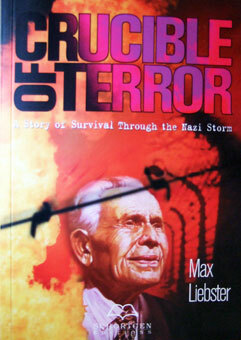 Crucible of Terror recounts in searing detail Max Liebster’s torturous journey through five Nazi concentration camps, including the notorious Auschwitz. Engulfed in terror and anguish, he feels himself drowning in despair when he suddenly encounters a phenomenon that restores his hope and dignity – a group of prisoners who wear the purple triangle. They are the Bibelforscher, or Jehovah’s Witnesses-persecuted because of their religious beliefs and their absolute refusal to bend to the Nazi ideology of hate. Liebster is fascinated by the failure of the mighty SS to break the spirit of the purple triangles, despite torture and even executions. As Liebster totters between death and life, between despair and hope, the purple triangles help him to carry on. It is a drama of survival, but even more, it is a story of hope and moral courage. Royalties from Crucible of Terror are donated to the Arnold-Liebster Foundation (Arnold-Liebster Stiftung).